So much of truck-bragging is done backwards, I think. Most truck owners, if inclined to brag, like to talk about how big their engines are, how many cylinders, and so on, as though the sheer size of the numbers they’re spewing makes them tough. I maintain the opposite is true; doing a job with as little as possible is what makes one really tough. 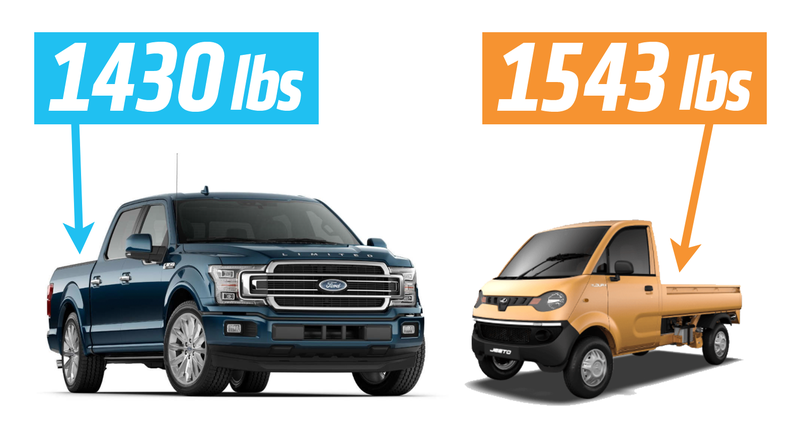 That’s why I’m so taken with this one-cylinder Mahindra pickup truck that, in at least one very, very specific comparison, beats a Ford F-150 in terms of payload capacity. I’ve been a fan of tough little Indian cars for a long time, little Mahindra work vehicles especially. I love how they manage to get the job done with, to American eyes at least, what seems like woefully inadequate capabilities. But they do it. Every single day. In conditions far more demanding than most American trucks will ever see. This new-ish little Mahindra pickup, the Jeeto, hits all my work-vehicle fetishes: small, friendly-looking, rear-engined, plucky, and far more capable than its stats would suggest. The Jeeto comes with either an 11 horsepower or a truly bonkers 16 HP one-cylinder 625cc diesel engine. That may seem laughably small, but in configurations with the ravenous 16 HP engine, the payload capacity of the Jeeto is 1543 lbs. Now, if we really comb through all the F-150 configurations, we can actually find more than one setup where the tiny Jeeto actually can carry more cargo in its bed than the mighty F-150. First, there’s the configuration of the SuperCrew body (Limited edition) with the 145" wheelbase and the 3.5L twin-turbo V6 EcoBoost engine. That combination has a payload capacity of 1,430 lbs. Again, I absolutely cherry-picked these specs, but that doesn’t change the fundamental point: these little one-cylinder trucks do real work, and that delights me. Of course an F-150 is going to outperform one of these in almost every other conceivable way. But it’s still incredible to realize that a little one-banger pickup that sells for about $4200 can be such a capable workhorse. There’a little van version, too, with roll-up side and rear windows, that I’m pretty smitten by as well. As an aside, the engine is canted at about 45°—does this mean it counts as a V1 engine? Or just a slant-1, I guess, since it’s only half a V. Still, a V1 chrome badge on the hood would look pretty sweet.